This took place exactly a month ago during the Gawai Dayak Holiday. Gawai Dayak is a festival celebrated by the Dayaks (Ibans and Bidayuhs) in Sarawak every year on the 1st of June. Read more about Gawai Dayak here. This year it falls on a Sunday, so we got 2 extra off days on Monday and Tuesday. Since it coincided with the boys' school holidays, we decided to head for Bako National Park (Bako NP). The Park is one of the nearest national parks to Kuching. It is only about 45 minutes drive from home to Kampung Bako, the gateway to Bako NP and where the Bako NP Terminal is located. From Kampung Bako, we chartered a boat which took about 30 minutes to reach the Park's head quarter. 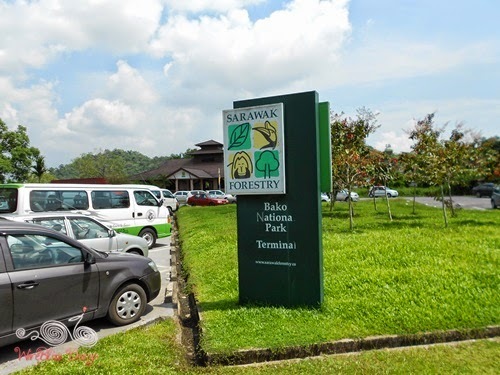 Bako National Park Terminal at Kampung Bako. Paid for the entrance fee and chartered boat here. Henry at the boat jetty/terminal. This will be his first time on a boat. to look at the tourists and boats. Getting ready for the short boat ride. Life jackets are available. The boys' first boat ride. View of the Bako River Mouth and Mount Santubong. We checked in to a two-bedroom Forest Lodge for the night stay. Our Forest Lodge, Type 4, 2 bedrooms. A bit old and run down. The wooden floor makes lots of noise as you walk. A short (5 minutes) plank walk to our Forest Lodge. Our room, three beds and a wardrobe. Keep all windows and doors closed at all time to avoid unwanted guests. Bathroom and toilet. Reasonable. Water piped from the city. Without hot water of course. This are the other type of Forest Lodge - bigger. A newer Forest Lodge Type 4 which is closer to the head quarter. During high tide, boats can take you to this jetty. Otherwise, we disembark at the beach, at knee deep water. Trail Map for visitors to plan for your walk. More details on the trails and the amount of time required for each trail. Not many people at the beach the next morning. The boys don't dare to go to deeper water, so they just play at knee deep water for a little while. Some nice scenery from beach. The only other group of people at the other end of the beach. Sandy but slightly murky water.